The Baker Hughes U.S. rig count was down another 67 rigs this week to 1,125. Oil rigs were down 56 to 866, gas rigs were down 11 to 257 and miscellaneous rigs were unchanged at two. 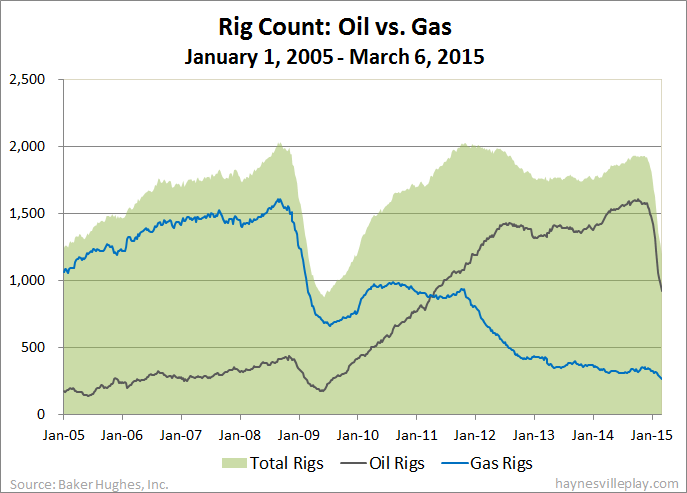 The gas rig count is now only 15 rigs away from the lowest recorded BHI gas rig count of 242 in 1992. By type, horizontal rigs were down 46 to 849, vertical rigs were down 11 to 166 and directional rigs were down ten to 110. Among gas rigs, horizontal rigs were down eight to 190, directional rigs were down three to 44 and vertical rigs were unchanged at 23.